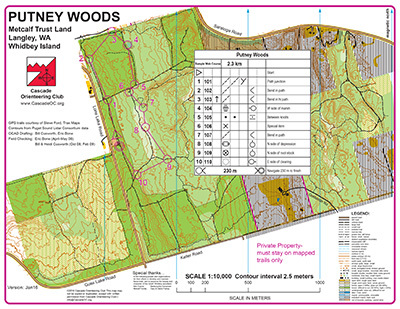 The Putney Woods map is all woodsy trails, with widespread underbrush alongside, reminiscent of Bridle Trails. But there are several key differences. First, there are areas of lighter vegetation in light-green areas that are accessible off-trail, offering a wider degree of navigational options, especially for more advanced navigators. 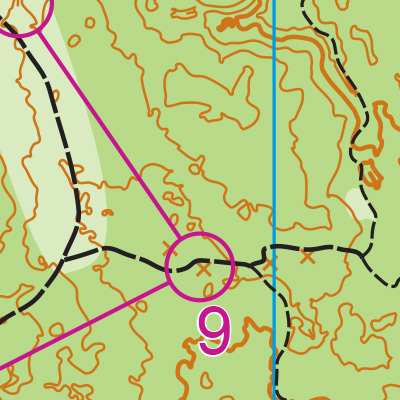 Novice orienteers should be aware that the northern part of the map doe not have a street border; it is directly adjacent to Saratoga Woods park, making it possible to end up off-map with a single turn onto the (one and only) wrong trail. (Note to course-setters: This is a good place for an out-of-bounds sign during the event). Many trails follow an almost grid-like patterns, making parallel feature errors possible, while others in hilly areas wind almost randomly up and down terrain. There are plenty of areas to practice contour recognition. One area to watch out for is the center-south part of the map; several trails lead into this open, appealing navigational area–but it is private property and should be avoided! (Note to course setters: Another good place for out-of-bounds signs). The shortest route includes a FERRY which requires a fare. Calculate your fare price here. Note that Google Maps time estimates do not include time spent waiting for the scheduled ferry to arrive, nor for long ferry lines. Check the ferry schedule and cameras to estimate how long boarding the ferry might take. You may either drive south to Mukilteo to take the ferry, or drive over the bridge through Deception Pass. Google Maps may show time estimates as fairly similar, though Google does not take into account how much time you might spend waiting to board a ferry. More information about the ferry route in the ‘From the South’ directions above. Turn right onto Mukilteo Speedway, and continue to the ferry.